Why Does My Dog Always Want Food? If your dog is always hanging around the kitchen for scraps or willing to eat anything at anytime, there could be a reason for the behavior. 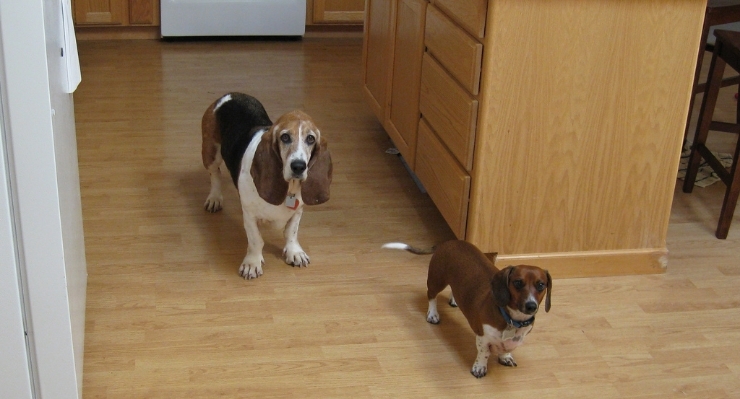 Have you ever had a canine companion that seems to be constantly sniffing around the kitchen? Lurking around the table when you’re eating? Shadowing you about until you start to hear the theme music from Jaws run through your head? I bet that a lot of us dog caretakers have felt that way — some dogs just never seem satisfied with the feeding that they’re getting and want more and more and…well, you get the idea. If you find that you’re feeding your dog regularly and yet he is still gazing at you with soulful (and hungry) eyes, it may be time to consider what is causing this behavior. It may be that your dog is just a darn ol’ glutton. Some dogs are and will hoover up anything if they are given the chance. Things like dropped food, cat food, other dogs’ food and, yes, the dreaded cat litter (ew!) are all considered edible. A full tummy is not a strong deterrent—especially when it comes to people food. Your dog knows that what you’re eating is much yummier than the kibble you’re dumping in his bowl, and he won’t miss a chance to get some of the good stuff! Try to restrain yourself from feeding your pup “people” food constantly — there are a lot of preservatives and other nasty things in there that just aren’t good for him. Feeding him people food on top of dog food is going to make him get fat, which is just as unhealthy for him as it would be for a person. Plus, it allows him to learn the dreaded begging technique, which is something you want to avoid at all costs. So if you feel as though you are feeding your dog enough and your veterinarian concurs, then you may just have a glutton on your hands. It may be wise to keep your dog out of the kitchen as much as possible, even using baby gates and other such barriers if needed. Another answer for your dog’s feeding frenzy could be that you’re just not feeding him enough. As our dogs grow and their activities change, it is not uncommon that they need adjustments to their diets. For example, if you’ve suddenly decided to get into shape and you’re taking your dog on long walks or jogs, he is burning more energy. So, he’ll need a bit more calories to keep that energy up. Or if you started out with an adorable puppy but now find yourself with 90 pounds of pooch, it just makes sense that he will need more food and possibly a different type of food as well. You don’t want a fat dog, but you also don’t want one who is starved. If you can see his ribs, it’s a good bet he’s not getting enough food and you should up his intake. This will vary by breed; some very active breeds, such as greyhounds, are still considered at an ideal weight even though you can see the outline of the ribs. Talk to your vet about the ideal weight for your specific dog. If you can’t see his ribs and you can’t even feel them, it’s time to slow down the gravy train because he’s packing on the pounds. Checking with your veterinarian is the way to go here as well. Going over daily activities and the amount of food that you dole out with your vet allows him or her to tell you whether it’s not enough, enough or too much. Go over dietary changes of any kind with your vet before making them. Now don’t freak out, but there could be a medical reason. Some conditions such as diabetes or hyperthyroidism play havoc with the system, and constantly wanting to eat could be a symptom of those. Diabetes in your dog is like diabetes in a person — basically the pancreas doesn’t manufacture insulin, which the body needs to handle sugar intake. Your (and your pooch’s) body needs sugar to create energy. If there is too much or too little sugar in the blood it can make your pooch act weird — and looking for more food would definitely be in line with this because they are instinctively looking for more sugar. Hyperthyroidism is just what it sounds like: a disorder of the thyroid gland. Thyroid conditions cause weight gain when the thyroid levels are too low (hypothyroidism); alternatively, it causes weight loss and increased hunger when thyroid levels are too high (hyperthyroidism). Keep in mind that this disorder is particularly tricky to diagnose because the symptoms are so similar to other ailments. Only a blood test will tell you for sure. It’s always best to consult with your veterinarian immediately if you think that your pet might have diabetes or any other illness. I can’t stress enough to never make assumptions. It is so easy nowadays to go search the internet and scare ourselves silly with possible conditions, but it is best to stay calm and remind yourself that there is no way of knowing for sure without talking with your vet. Wait for confirmation from your vet before making any major changes to diet or medication. And if your dog is just a darn ol’ glutton? Then it’s time to put a stop to his gravy train.